This archive holds all posts form July 2, 2011. In 1846, the United States took control of New Mexico and Arizona. The United States Army . . . occupied the territory which had been acquired from Mexico. 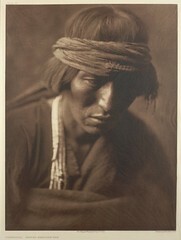 One of the major priorities of the new regime was to “pacify” the Navajo who had been raiding against the Spanish settlements in the area. However, instead of bringing peace, federal government actions often brought increased warfare. The American army made it clear that they intended to side with the European settlers without examining the causes for the hostilities. The army refused to recognize that the Indians had often been the victims of unfriendly European settlers [colonists]. an industrious, intelligent and warlike tribe of Indians who cultivate the soil and raise sufficient grain for their own consumption and a variety of fruits. manufactured blankets and woolen goods. Other traders during this time observed that Navajo blankets were coveted trade items among other Indians, such as the Cheyenne. In 1863, General Carleton issued an ultimatum to the Navajo: they were to peacefully transfer to the reservation at Bosque Redondo or be treated as hostile. Colonel Kit Carson began to wage a “scorched earth” campaign against the Navajo. The plan … called for all male Navajo to surrender or be shot. This resulted in the Navajo Long Walk [see here on this march of 10,000 Navajos and Apaches at gunpoint], their imprisonment, and having the Treaty of Bosque Redondo forced upon them in 1868. This was in the middle of the U.S. Civil War. Clearly, the white manifest destiny’s call could not even be put aside during that massive war. Once again, our highly racialized and oppressive history in regard to indigenous Americans is not realistically taught (are not taught at all) in most of our schools to most of our country’s children or adults. We are nation built on land theft, genocide, and slavery, but I rarely even cursory discussion of any of that in the mainstream media–and indeed even in the white progressive/left media online or in print publications. Why do you suppose that is?